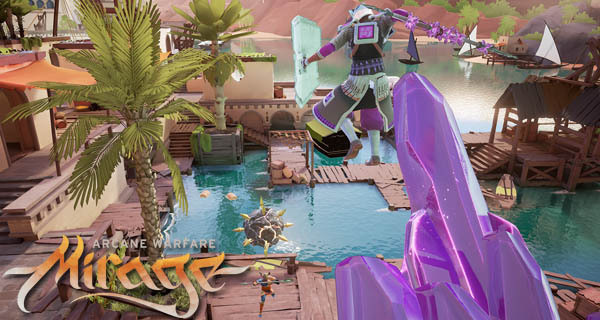 Mirage Arcane Warfare Bridge map is the newest trailer for the game. The video is about a minute and thirty-seven seconds long, giving us a quick look at what seems to be a quiet, serene location. The Bridge map is available to be played in two modes of the game: Team Deathmatch and Capture the Flag. As you may see in the video the location is grand with a lot of walkways and places to run up and hide or dodge your enemies with. Mirage Arcane Warfare is a skill based multiplayer action FPS. It is gory and violent letting you kill your enemies by tearing them up limb from limb by using melee combat or catastrophic magic on them. There are many playstyles to perfect and six different classes to choose from. Dive deep into the gameplay which tells a story of arcane civil war. The game is set to launch on May 23, 2017, for PC (Windows). Also, in other news, the Mirage Arcane Warfare Beta is currently running up until the game’s full launch. Pre-order the game and get access to participate in the Beta. What do you think of the Arcane Warfare Bridge map? Do tell us your thoughts in the comments below. The newest action game from Tom Banner Studio’s called Mirage Arcane Warfare is ging to be released on May 23, 2017. And before the game’s release, a beta for the game is currently running. Those who would want to join can pre-order the game to gain access.